Defect sizing in pipeline inspection allows companies to determine when a pipe must be replaced, avoiding costly repairs in their assets. 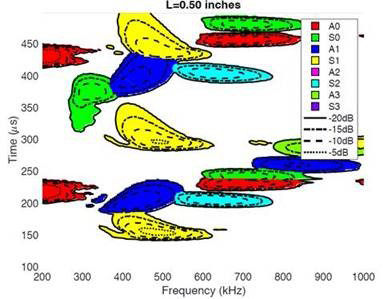 To tackle this issue, Lamb ultrasonic waves generated through Electro-Magnetic Acoustic Transducers (EMAT) allow thickness estimation without direct contact with the surface of the metallic material under investigation. 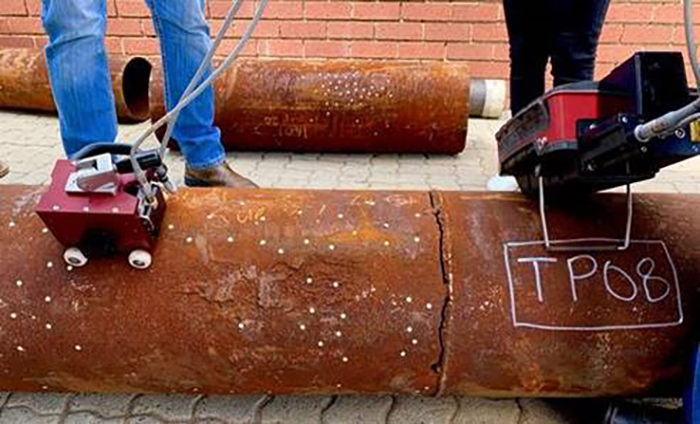 The use of this technology with a meander-line-coil allows generating waves in a directional way, which facilitates differentiating between circumferential and axial scans in Non-Destructive Testing (NDT) for pipeline inspection. Selection of the appropriate coil and frequency when performing defect quantification with guided Lamb waves is crucial in order to minimise the estimation error. The severity of the defect and therefore the remaining wall loss is calculated based on the phase and amplitude information extracted from different wave modes. This paper presents a theoretical study in which the selection of the coil and the frequency for multimodal thickness estimation are analysed. The objective is to determine the relationship between the performance of the estimator and the configuration of the sensing system used for the inspection. This problem was approached from two perspectives: from a signal processing based theoretical framework; and from the simulations obtained by a Finite Element software. Results demonstrate the suitability of the proposals, improving the estimation of the residual thickness. Read the full-text here.